New Delhi: Tech firm Apple on Thursday said its 16GB iPod touch portable media player will now be available for Rs 16,900 in India. Available in vibrant colours like pink, yellow and blue, the iPod touch is equipped with a 5 megapixel iSight camera with 1080p HD video recording, 4-inch Retina display, A5 chip and FaceTime camera, Apple said in a statement. The 32GB version will be available for Rs 20,900, while the 64GB version will be priced at Rs 24,900. 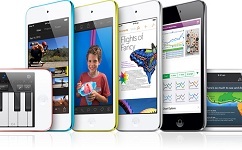 The iPod touch features the iOS 7 operating system, offering more than 200 features including Camera app filters. Later this year (in fall - September), the device will support the latest iOS 8 version. Apple had launched its 'iPod' range of portable media players in 2001 and its various versions include iPod Shuffle, iPod Nano, iPod Touch and iPod Classic. According to the company's annual report, Apple globally sold over 26.3 million units of iPods in the year ending September 28, 2013.